Jewellery can be personalized with a name, initial, date or whatever word or phrase you choose. Generally personalised jewellery is defined as made to order or customised to order jewellery. Pieces can be individually hand stamped with lettering. Some letters may not be perfectly straight due to this fact and every piece of jewellery will be different which makes it even more personal. No two are the same. 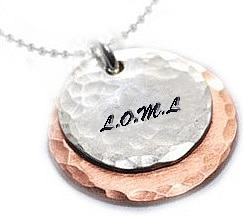 Letter alignment, spacing, and depth of letter impression will vary for hand stamped jewellery. 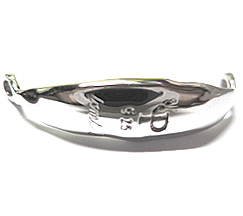 Engraving may also be used to personalise your jewellery and there are several methods used to engrave jewellery. The art of hand engraving is still alive and well despite the rise of computer aided engraving machines. Impact printers may also be used to “engrave” ever so slightly on various forms of jewellery to distinguish them with customised messages such as dates, children’s names, love you messages or pretty much anything you can fit on the piece of jewellery. How Do You Make Personalised Jewellery? We will focus on making two styles of personalised jewellery, firstly hand stamped jewellery and secondly engraved jewellery. Using these methods all types of jewellery are able to be personalised with any message or initial, date or even coded message. In this way stamping and engraving jewellery is connecting families, friends and loved ones through personalised handmade jewellery. Where Can I Buy Personalised Jewellery? Purchasing or even making personalised jewellery is born out of your own desire to wear jewellery that really means something to you. Above we show you several ways to make your own personalised jewellery however, if time is against you, it may be easier to buy personalised jewellery online. At The Jewellery Shop we are proud to offer personalisation services including hand stamping and engraving of your jewellery so look no further as we have a lovely selection of personalised jewellery for you to make your own. View our large selection of sterling silver chains. Personalised jewellery is now very common for online jewellery shops so don't be overcharged. Hand stamped jewellery has meaning because of YOUR message, not the price tag.